Day 15-Working With Joomla Components Menu-Contacts! Today, We will start with next components menu “Contacts”. When u click on Contacts under components menu there are two more sub menus –“Contacts Manager” and “Category Manager”. Am going to write about only “Contacts Manager” as “Category Manager ” is same as mentioned under “Banner” . So let’s start with the “Contact Manager”…..
What Is Contact Manager ? 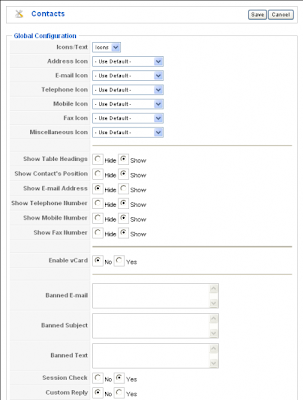 The Contact Manager screen allows you to add contact information to your Joomla site. You can enter information such as name, address, phone and e-mail. You can also link contacts to registered users. Afterwards, you can use the Menu Manager to create front-end links to the contacts. See below contact manager in figure. I have highlighted the column header, toolbars and contact manager header with blue . Let’s discuss about these in detail. Select Components → Contacts → Contacts from the drop-down menu on the back-end of your Joomla installation, or select the “Contacts” link from the Contacts Manager – Categories. What Are Column Headers ? Click on the column heading to sort the list by that column’s value. As shown above in figure. Checkbox. Check this box to select one or more items. To select all items, check the box in the column heading. After one or more boxes are checked, click a toolbar button to take an action on the selected item or items. Many toolbar actions, such as Publish and Unpublish , can work with multiple items. Others, such as Edit, only work on one item at a time. If multiple items are checked and you press Edit, the first item will be opened for editing. Category. The Category that this Contact belongs to. Clicking on the Category Title opens the Category for editing. See Contact Category Manager – New/Edit. Note that Contact Categories are separate from other Categories, such as those for Articles, Banners, Newsfeeds and Web Links. Click the Parameters button to open the Contacts Global Configuration window. This window allows you to set default parameters for Contacts, as shown above in global figure. Address Icon. Icon to use for Address. Select an image file in the drop-down list box. These images are located in the ‘images/M_images’ folder. Telephone Icon. Icon to use for Telephone. Select an image file in the drop-down list box. These images are located in the ‘images/M_images’ folder. Mobile Icon. Icon to use for Mobile phone. Select an image file in the drop-down list box. These images are located in the ‘images/M_images’ folder. Fax Icon. Icon to use for Fax. Select an image file in the drop-down list box. These images are located in the ‘images/M_images’ folder. Miscellaneous Icon. Icon to use for Miscellaneous. Select an image file in the drop-down list box. These images are located in the ‘images/M_images’ folder. Show Contact Position. Hide or Show the Contact’s Position. Show E-mail Address. Hide or Show the Contact’s E-mail address. Show Telephone Number. Hide or Show the Contact’s Telephone number. Show Mobile Number. Hide or Show the Contact’s Mobile phone number. Show Fax Number. Hide or Show the Contact’s Fax number. Enable vCard. Whether or not to enable vCard support for Contacts. vCard is a special file format for electronic business cards. This allows contact information to be sent in a standard way via e-mail. Note that this parameter must be set to “Yes” for the vCard feature to work. If this parameter is “No” and vCard is set to “Show” for a Contact, the vCard link will show but the link will not work correctly. It will only show a blank screen. Banned E-mail. Enter any e-mails to be banned from the site. E-mail addresses containing any of the listed text will be banned. Separate different words with semi-colons ‘;’. For example, the entry “spam;junk” would ban e-mail addresses such as “myspam@.com” or “aeddie@junkisgood.com”. Banned Subject. Enter any e-mail subject words to be banned from the site. Separate different words with semi-colons ‘;’. For example, the entry “spam;junk” would ban e-mail subjects such as “This is not spam” or “I Like Junk”. Banned Text. Enter any e-mail text words to be banned from the site. Separate different words with semi-colons ‘;’. For example, the entry “spam;junk” would ban e-mail content such as “This is not spam” or “I Like Junk”. Session Check. Whether or not to check for the existence of a Session Cookie on the User’s computer. If set to ‘Yes’, Users without Cookies enabled will not be able to send e-mails. Custom Reply. Whether or not to use the Custom Reply. Setting this to ‘No’ allows integration to other systems. You need to add at least one Category for your Contacts before you can add your first Contact. Categories are added using the Contacts Category Manager.